When we come to the NT, in the 1st Century Church, Christians were taught to call on the Name of the Lord when they got baptized, right at the beginning of their spiritual life. This was Paul's experience when he began his Christian life. I've read this passage so many times but somehow these words "Calling on the Name of the Lord" escaped my eyes. I always knew that Ananias instructed Paul to get up and be baptized to have his sins washed away. But what about "Calling on the Name of the Lord?" I never took too much notice of these words. Obviously 'Calling on the Name of the Lord' was something Ananias and the early disciples did often, thus Ananias exhorted Paul to do likewise. Notice Paul was exhorted to call on the Name of the Lord at the beginning of his spiritual life, not at a later stage. The First Century Christian leaders indeed laid a very firm foundation in the prayer life of the newly baptized believers. We also need to do the same. 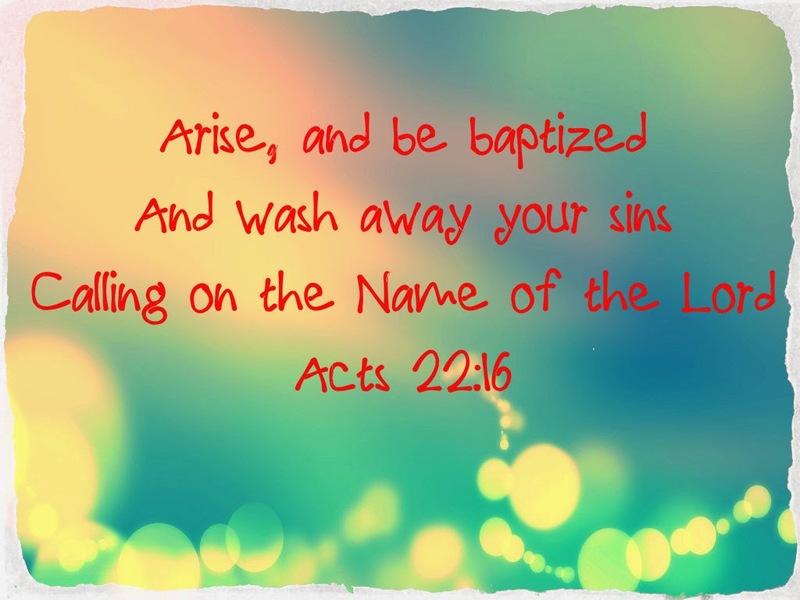 Here at baptism, Paul called on the Name of the Lord to have his sins washed away. Clearly calling on the Name of the Lord has to do with salvation, for the remission of our sins. The calling is not a mere verbal calling but it is a new beginning to express our faith in obedience to the Gospel. The word "Calling" in the participle form describes an action that is ongoing. This means that "calling" is a progressive continuous action. You keep on calling His Name. So Paul did not just call on the Name of the Lord at baptism and stopped there, but that he continued calling on the Name of the Lord throughout his Christian life. It doesn't mean that everytime Paul called on the Name of the Lord, he had to get rebaptized again and again. Obviously there is much deeper content involved in this action of calling that threads through Paul's prayer life. This calling on the Lord results in continual rich blessings from God (Rom 10:12-13). Imagine this! This is going to be something we will learn together as we move on in these articles. The application for us today is that we too, must first call on the Name of the Lord to have our sins forgiven at baptism. There must be a beginning to call on the Name of the Lord. Did you call on Name of the Lord when you were baptized? We need to get back to this "forgotten basics". This teaching of calling on the Name of the Lord is not just for the mystics or the mature Christians as we might think. Let us exhort newly baptized Christians to call on the Name of the Lord. In the coming articles, I will go into more detail to explain on this phrase "Calling on the Name of the Lord". This term contains very deep meanings in both OT and NT.